Digital radios from Motorola offer many advantages over analog, including improved voice quality with greater coverage, better privacy, better battery life and more. That's why it's critical to consider digital migration now - so when you're ready to upgrade, you'll choose a system with the greatest benefits for the long term. When you use a normal analog radio, every sound that's picked up by the microphone is transmitted. If there's a lot of background noise, it can be very difficult to understand you. Digital technology is purer. The software focuses purely on your voice, paying no attention to the machine clatter or the crowd noise around you. The result is exceptional voice clarity. While all radio signals grow fainter as they go further out, the voice quality on analog radios degrades much more quickly. At the far edge of coverage, even though signal strength is similar, digital voice will be clear and intelligible while analog voice will be garbled and masked by static. Battery life is a big challenge for all mobile devices. But because digital technology is much more energy-efficient than analog, it reduces battery drain and improves talk time. Count on your battery to last up to 40% longer when you use a digital radio. When it comes to spectrum efficiency, nothing matches digital technology. 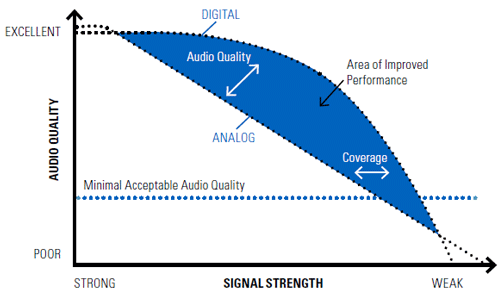 Digital is so bandwidth-efficient, it can accommodate two completely separate "channels" in one 12.5 kHz channel. As well as making more efficient use of precious radio spectrum, this also minimizes your licensing costs, especially as your business grows. Motorola Solutions Has worked with third-party developers to build a robust marketplace of enhanced applications to work with MOTOTRBO digital two-way radios. These applications include GPS tracking, Man Down, text messaging, email, voice dispatch, work order management and much more. Learn more about our MOTOTRBO applications. Find out more about our digital portable radios. Find out more about our digital mobile radios. Do I Have To Upgrade To Digital? No, you don't have to upgrade to digital right now if you don't want to. You can continue to use the analog radios that you currently have, but you may not be able to purchase the same models that you are currently using because many analog radios have been discontinued. However, it does make sense to look at the migration plan to digital. Each of our clients is different and have different infrastructure, internal timetables, budgets and abilities to upgrade their two-way radio systems. We can put together a custom analog to digital migration plan for each of our customers that will make sense for their business. The majority of our customers are making a clean break and are trading in their old analog radios and making the upgrade to MOTOTRBO digital radios. Now is a great time to do this as Motorola Solutions is offering extensive trade-in offers for your old analog two-way radios. We also have 0% financing for 12 months on larger projects. Some of our customers are adding digital radios to their current analog system. These digital radios will work in analog mode in the short term. This gives you some breathing room to purchase digital radios now and use them in analog mode for a period on your current system. Then they make the full migration at a later time. You will need to update the software on the digital radios you have purchased, but you will not have to buy a new radio. You can stick with what you have for now and continue to use your analog radios. You can purchase similar analog radios if they are currently available and build up your analog fleet. You should find out if your radios are still available and purchase them now. At some point, you know that you will have to upgrade to digital but this delays that decision for some time. Honestly, we don't recommend this approach but it may be the only thing you can do in your circumstance if you don't have the budget or the ability to upgrade to digital now. Please fill out the short form below and tell us a little about your current system and your company needs. We will offer a free upgrade from analog to digital migration report for your business. © . Radio Resource Inc.
Motorola Solutions Channel Partner Denver, Colorado.